Buzzwords like biodegradable, bio-based, eco-friendly, renewable, non-toxic, green, etc., are often heard echoing throughout industry. Over time, these words have become powerful tools and selling points for lubricant manufacturers and marketers. However, they can also be misleading. Along with legislative compliance, one of the reasons for this recent green initiative is the growing awareness and demand to use more environmentally safe products. The fact that petroleum-derived mineral stocks have finite resources has also created a pressing need to find alternative/renewable sources. While there is no universally accepted definition for environmental safety, factors like biodegradability, eco-toxicity, bio-accumulations and renewability must be taken into consideration when accounting for the safety of the environment. Lubricants, by virtue of being petroleum based, have been classified as being of environmental concern. In the past, large quantities of industrial lubricants have been irresponsibly disposed of into the environment as used oils and spills or accidentally, which is a matter of grave environmental concern requiring immediate attention. There are two basic approaches for dealing with environmental safety with regards to lubricants. The first is to find ways to eliminate the disposal of lubricants into the environment. The second is to use environmentally safe products in environment-sensitive applications such as agriculture, forestry, municipalities, mining, marine, etc. In addition, the different terms floating across industry to measure/evaluate environmentally safe products are not well-defined and need better understanding. There are two generally used measurements for biodegradability. The first is primary degradation, which is measured as the reduction of the carbon-hydrogen bond. This is determined with infrared spectroscopy (IR), which corresponds to the direct measure of the percentage of lubricant breakdown. The most widely used way to measure this degradation is by the Coordinating European Council (CEC) L-33-93 test method run for 21 days. The other type of biodegradability measurement is secondary degradation, which is better known as ultimate biodegradability. This measures the evolution of carbon dioxide through the degradation process over a period of 28 days. The most common method used to determine ultimate biodegradability is by the Organization for Economic Cooperation and Development (OECD) 301B/ASTM D5864. The benchmark for qualifying a lubricant as biodegradable is if its biodegradability is more than 80 percent by the CEC L-33-93 method or more than 60 percent by the OECD 301B method. Bio-based is a term that was mainly coined in the United States and based on the necessity to derive renewable products from vegetable/plant/animal-based materials. The industry or regulatory authority (USDA) did not intend for bio-based to imply a 100-percent vegetable oil-based formula, as other non-bio-based ingredients might be necessary to meet industry performance standards. The USDA and other regulatory/industry organizations have established that the use of 50 percent or more bio-based material in a formulation could allow a product to be considered bio-based. Thus, the more accepted definition of bio-based lubricants would be those products formulated with a majority of renewable and biodegradable base stocks. For example, fatty acids used in making grease thickener components qualify as bio-based even though they are not biodegradable. Therefore, bio-based products may not necessarily be 100-percent biodegradable, but they must be agro-based and renewable. A synonym for being environmentally friendly, green is probably one of the most attractive terms in industry, yet it often can be misleading. Some products that are not even based on vegetable oil may still be marketed as environmentally friendly lubricants. While these types of lubricants may be free of heavy metals and other potential toxic ingredients, they are not biodegradable. Consequently, it’s important to be careful when selecting such products and to be aware that green does not necessarily mean biodegradable. Just being a green color or free from heavy metals does not make a product environmentally friendly in the real sense. This requires being biodegradable or derived from renewable sources. Theoretically, environmentally safe products are those that degrade quickly and naturally with non-toxic decomposed fractions and that are based on renewable sources. These lubricants must be formulated with renewable/vegetable oils in majority, readily biodegradable and free from heavy metals and other toxic ingredients/byproducts. Environmentally safe products offer certain performance advantages. When formulated with vegetable oils, these lubricants exhibit better lubricity, which means reduced friction and wear, a high viscosity index and high flash points for improved safety. The inherent drawbacks associated with these types of products include their limited high-temperature capabilities as a result of inferior oxidation and thermal stability, restricted low-temperature applicability due to higher pour points, and poor pumpability at sub-zero temperatures. As these lubricants are expected to degrade over the course of time in the presence of oxygen, their shelf life also is limited and does not compare with that of mineral/synthetic oils. Another aspect that should be considered when switching to vegetable oil-based greases is their compatibility with mineral oil or synthetic oil-based greases. Recent studies indicate that some vegetable oil-based greases have been found to be incompatible with mineral oil-based greases due to the chemistry differences between vegetable and petroleum oils. While our knowledge of environmental safety is still in its early stages, more concerted efforts are needed to clearly define the related terms. 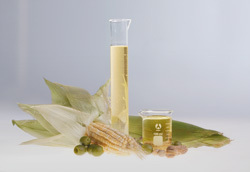 If choosing vegetable oil-based environmentally friendly lubricants, keep in mind that there are dual objectives to fulfill, with one being environmental safety and the other the quest for alternatives to petroleum base stocks. The future of these classes of lubricants will greatly depend on how these disadvantages are overcome while still being competitive in price.